The POSITIV range of skateboards is the brainchild of one of the most famous skateboard kings in the world: Andy MacDonald. Better known as Andy Mac, he is the only man who has had the honour of being allowed to skate inside the White House! The Walking Orca skateboard is one of the Animal range of boards and it comes with a fun image of an Orca painted on to the underside of the board. All of the POSITIV boards have been produced to an exacting specification and this particular board is no exception. The Walking Orca board is made using the AirLam process whereby multiple birch plies are fused together using waterproof adhesive. The end result is a strong, stylish board capable of withstanding whatever you throw at it, which is great for beginners looking to improve their skills in the local skate park. The bottom of the Walking Orca board has been coated with a special SST treatment to help increase the length of slides, which is great if you want to practice tricks. The Animal Walking Orca skateboard looks great and is great value for money. 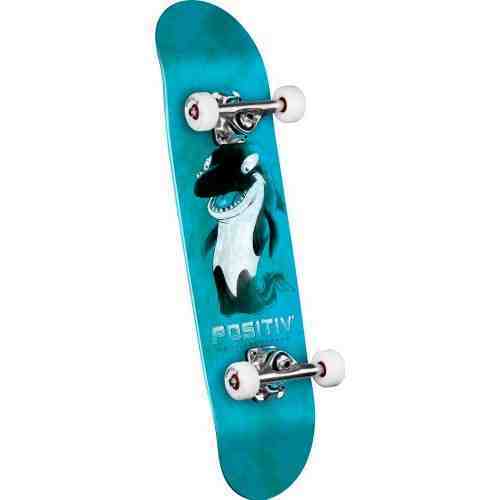 Priced to suit skaters on a budget, this board is popular with new and experienced skaters. But despite the Orca board’s very reasonable price, it is has a rock solid construction and since it is endorsed by Andy Mac, you can buy with confidence. The Walking Orca board also comes ready assembled, which is perfect if you are buying one as a gift. On the downside, although the Walking Orca Complete skateboard is excellent value and a good buy for anyone new to skateboarding, experienced skaters might find that the bearings don’t stand up to hard riding over a long period of time. But this shouldn’t be a problem as bearings can easily be replaced or exchanged for parts of a higher specification. Some users also found the wheels too soft for their liking, but this is perhaps down to personal preference. If you are looking to have a shot at skateboarding for the first time and want a good-looking board for a very reasonable price, you could do a lot worse than the POSITIV Walking Orca Animal skateboard. The board looks cool and is well made, plus it won’t cost a fortune. Best suited to skaters who primarily use their boards on the street and in skate parks, the Walking Orca Complete is perfect for kids and adults of all ages so invest in one today and start skating in style. You might not end up with the skills to match the legendary Andy Mac, but at least you can enjoy owning a quality skateboard with high quality components that is more than capable of doing plenty of stunts and tricks. This entry was posted in Positiv, Reviews, Skateboarding, Skateboards and tagged Andy MacDonald, Positiv, Skateboard, Skateboard Review, Walking Orca, Walking Orca Complete, Walking Orca Skateboard. Bookmark the permalink.